Happy Friday Blog friends! 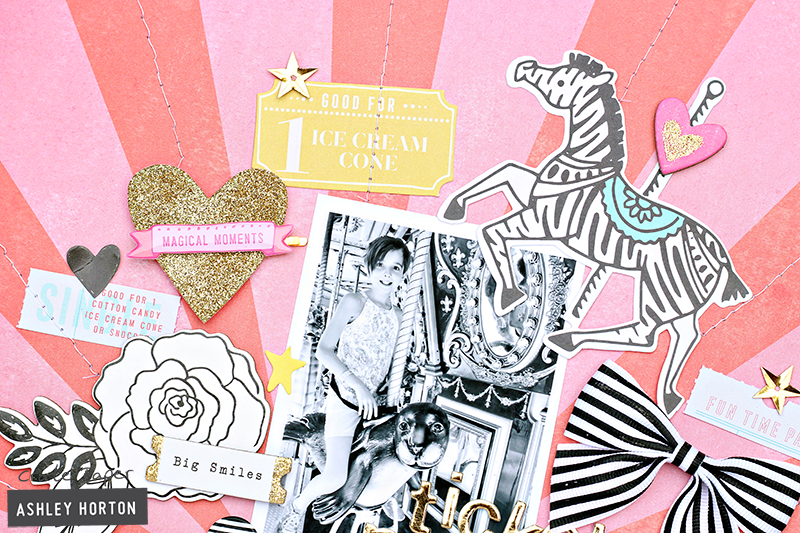 I've got a new layout to share with you today, using the Crate Paper Carousel collection by Maggie Holmes. And what better photo goes with the Carousel collection, than one of your kids on a carousel!! As I was browsing through the 12x12 papers, I decided to use the fun Canopy patterned paper. I really loved the burst design, and the rest of my design was based on the paper. I placed my photo at the bottom of the page, and I wanted to create a half circle look with the embellishments to resemble a carousel. 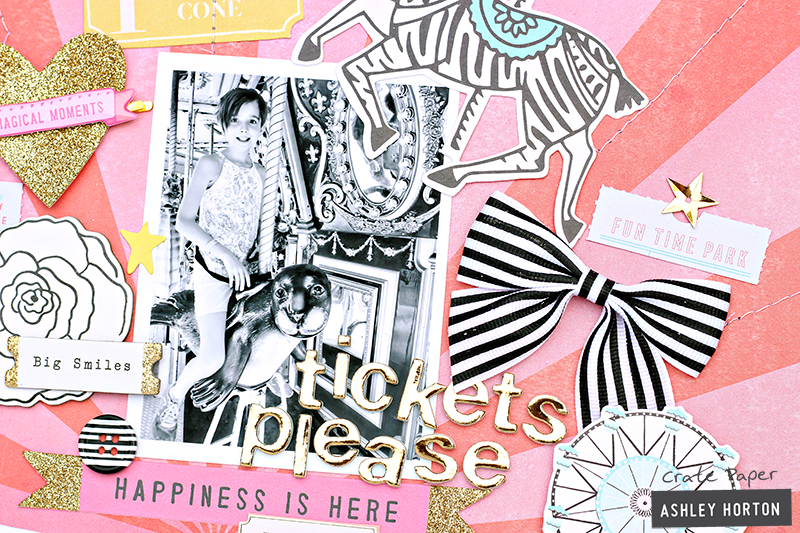 I started adding embellishments, with the carousel zebra. It's placement actually helped to cover up someone else in the photo, that ended up being reflected in the mirror of the carousel. Layering an embellishment over a photo is a great way to cover up or disguise something that you don't want to show. 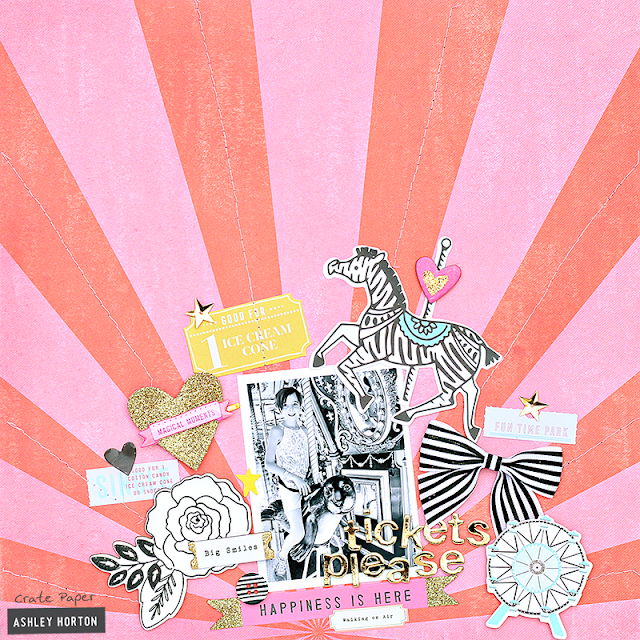 I mixed other embellishments from the Ephemera Pack, Chipboard Stickers and Sticker sheet. I used the Gold Foam Thickers from the collection for my title, and I love the pop of gold layered over the black & white photo. Once I had all of the embellishing completed, I used my sewing machine to stitch along some of the burst pattern, for extra texture on the layout. You can find the Carousel collection in some of your favorite online shops! Head over and grab some of your favorites from the collection!